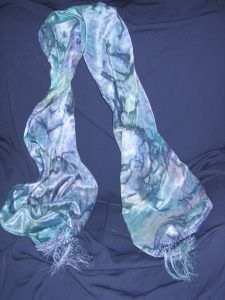 What: For only $45.00 Painting on silk is an opportunity to get in touch with the artist in each of us. 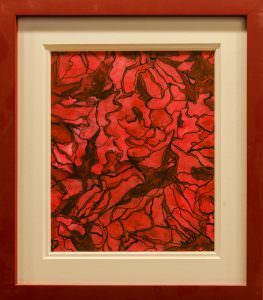 Using abstract and watercolor techniques you will create one or two small silk paintings that can be matted and framed. 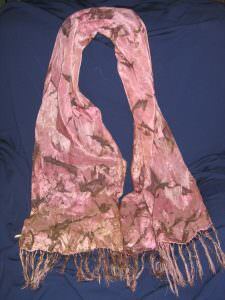 You’ll also create one or two beautiful silk scarves to keep for yourself or give as a gift. (Christmas is coming). No prior experience is necessary. Wear old clothes or an apron. Be prepared to be amazed and inspired by your own creativity. Who: You – NO experience needed and your instructor Allie Bergman began painting over fifteen years ago and has studied with a number of artists to refine her work. She continues to take a variety of art classes to further enhance her skills. Through these experiences she has learned that by mixing various combinations of colors together she can create and express positive feelings and emotions through her art. Refreshments provided, however, if you would like wine, bring your own! !